The Khyber Gulmarg is luxury in every way. I have now stayed with them twice and I felt thoroughly pampered on both (I was invited on the trips) the occasions. I was there in March 2013 and then in September 2014. On the recent trip one member of our team remarked- this looks like a luxury resort in European Alps. As I have not stayed in a luxury resort in Alps, I cannot vouch, but then you get the general idea. This was the view from the balcony of my room. In March, the entire green area was white, as it was covered in snow. There are things that have not changed since March 2013, like their excellent breakfast spread. 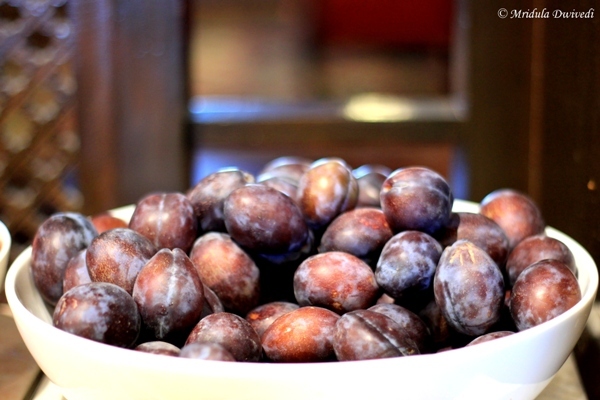 They have much more beyond the fruit bowl, I am trying to encourage you to eat healthy by posting this photo. I personally love their South Indian spread. But if you indulged in food right from the breakfast, do work it off in the all weather heated swimming pool. I managed to take a quick dip and then indulge in the Jacuzzi. This is a new addition, the swimming pool was being constructed in 2013. Two other additions are the spa and the gym. I have tried the spa and it is amazing, I could not check out the gym though. The Khyber does excellent Kashmiri food. I love their nadru (lotus stem) but I am told that I miss out on a lot of good stuff by being a vegetarian. 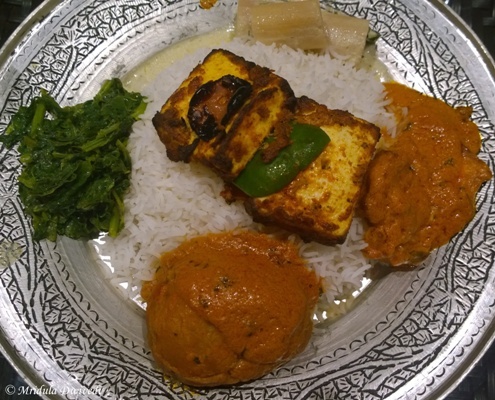 The saag and the paneer were also excellent. So, in relation to the food, the gym and the swimming pool are excellent additions, the guests need them! This was my room at the Khyber and it was lovely. The rooms are heated. My March visit was pleasant in large measures because my room was heated. Otherwise it was way too cold. 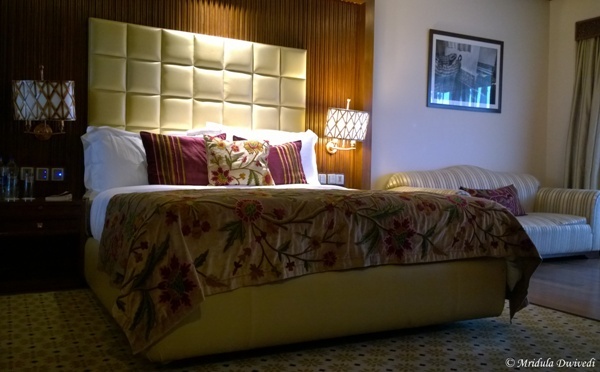 So, if you are looking for luxury in Gulmarg, you know where to go. 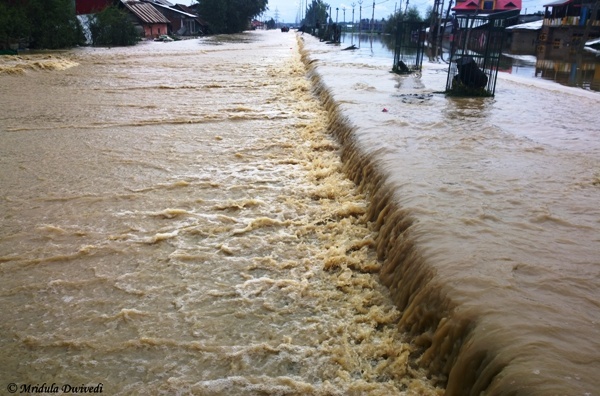 However, in September 2014, J&K was badly flooded. Even though Gulmarg was never affected and it is now ready to receive visitors, many would cancel the bookings and it is understandable. The resort is ready to receive visitors. The connecting roads are open. As I said when I visited Uttarakhand after the floods that if you wish to make a contribution, supporting tourism is one of the ways. Give it a thought. This is a petty post. This is about my difficulties in catching a flight out of Srinagar yesterday, the day Jhelum River breached its banks. 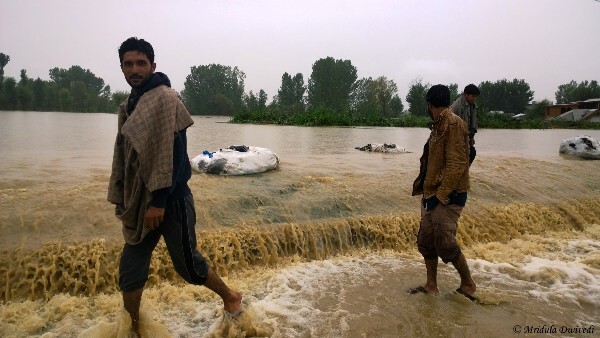 However, this minor tragedy collided with the major tragedy of the Srinagar floods, of the Kashmir Floods. I went to The Khyber Resorts (Gulmarg) on Friday, September 5, as I was invited. 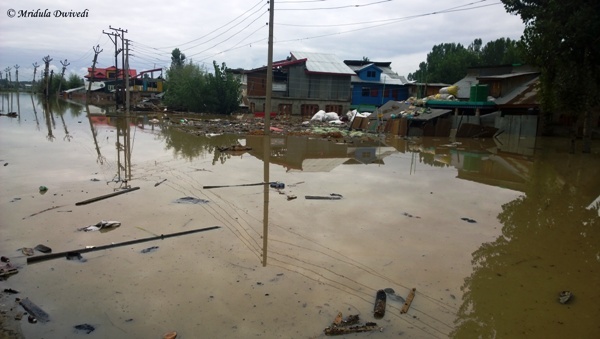 Apart from minor traffic jams I did not face much of a problem in getting out of Srinagar even though it was already flooded. A bridge near Gulmarg has collapsed so we had to take a 10 kilometers detour through a village to reach the resort. 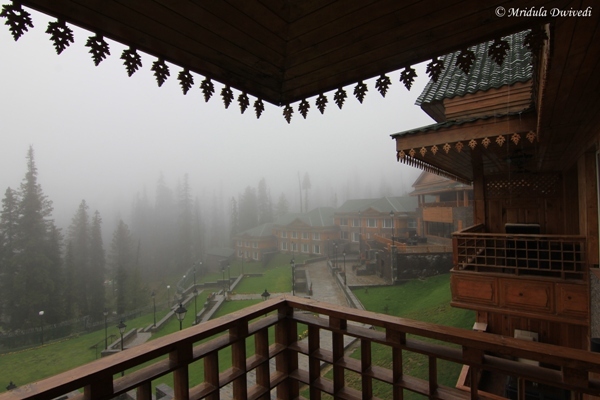 Gulmarg was misty, it rained but we had fun. Coming back on Sunday, September 7, was a different story though. When we started from Gulmarg it was not raining, which was a good sign or so we thought. Mohammad Akbar was our driver, he has been with the resort from the early days. There were six of us in two cars. We were making good time and in our inexperience we made an unscheduled stop! Whatever the duration, we did make a stop and in the process got separated from the first car. Akbar at one point told us to hurry up as the situation on the ground was not too good. That made the three of us come out of our stupor. We actually had a smooth sailing till Bemina in Srinagar. At Bemina the water was gushing over the road, I have not seen anything like that in my life. People standing on the way told us that the Scorpio could cross. But Akbar was not too sure. After an initial round of opinions, we decided to follow whatever Akbar suggested, as he was the local and the most experienced. I saw people from the houses nearby standing on the road. There was an announcement going on in Kashmiri. Akbar said it was a call to move the women and children to the local mosque. They had shelter for the animals too. We hanged around Bemina for a while. Trucks were stranded as the Srinagar Jammu highway is closed. People were burning wood on the road divider to keep warm, it become a social space. We went to the edge of the water. Akbar decided that he would not drive through and we respected his decision. Oh to be a Child and Sleep through it! We decided to head back, at least for some distance, away from the water. I found a wash room in one of the restaurants. I saw army personnel in this area and asked them how was the situation beyond the water torrent? One of them said I would still miss my flight as there was a massive traffic jam after that in the city. I talked to a family which had a flight to catch to Jaipur at 4.00 pm . 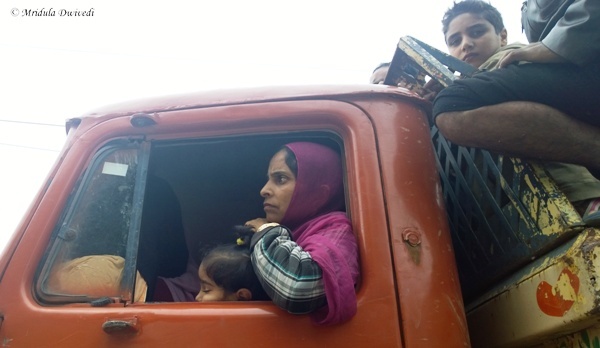 They said they managed to cross the water at Bemina by getting into a truck with all their belongings. But the truck turned back due to the traffic jam. They are worried about missing their flight, so was I. Mine was at 2.25 pm and it was already knocking on 12.00 noon. We thought we would have tea. But no one was really in the mood. We thought of heading back to Gulmarg. As we turned back, I feared that my family would badly panic if I got stranded. I also had to be at work on Monday. But all of us agreed that we will not take any undue risks. We also worried about the other car, as our cell phones were not working. As we were about to pull out, a local came and tipped Akbar about an alternative route which would take us to Badgaon, and to the airport. We were assured by the army people that the flights were taking off, if we could reach the airport. We decided to try the alternate route. I was hopeful that the flight would be delayed as Srinagar was anyway on red alert. It was a narrow village route that we took. The roads were bad but it had only minor water logging. The paddy crop which would have been harvested in 15 days was washed out. When the water will recede, it will leave other problems in its wake. Akbar drove with infinite patience on the roads that were bad. He frequently asked for directions. 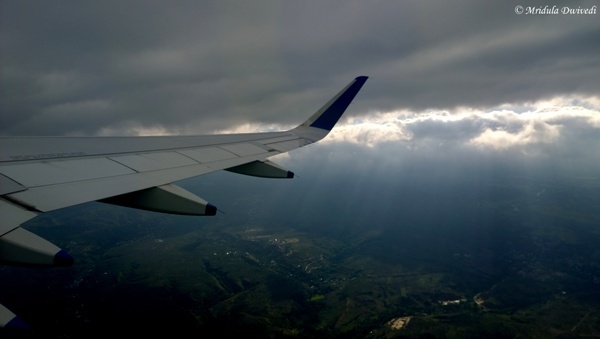 At one point he asked me, “Am I stopping too many times for asking directions?” I told him, “That is not a problem at all, menfolk usually don’t ask for directions and get lost!” Around 1.20 pm we were at the outskirts of the airport. I started feeling hopeful. Phones were still not working. Then I spotted what looked like a traffic jam. Thankfully it was a false alarm. We finally reached the airport, clearing the outer security, at about 1.30 pm. We gave lift to a father-daughter duo close to the airport. 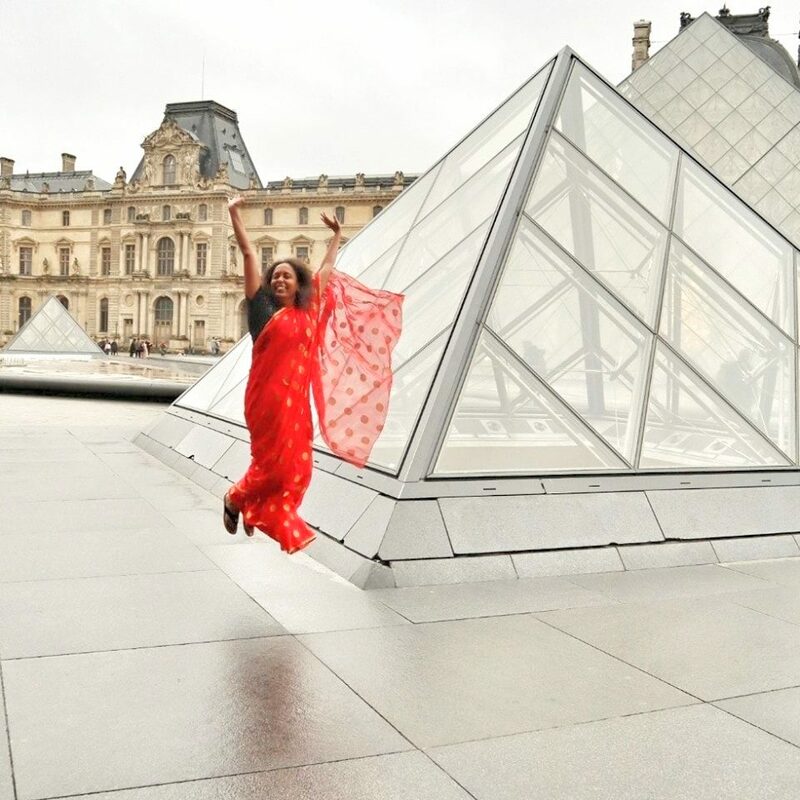 When we got down in front of the terminal Akbar exclaimed “Ham jeet gaye!” We won! After thanking him and tipping him (which would never be enough) I flew through to the Indigo counter and presented my ticket. They accept it without any fuss. I made it to the flight. In a rare departure from the norm, the security at Srinagar was kind to the passengers. They were thorough but not too gruff. In my hurry, I forgot to put tags on my hand luggage. They found two tags from somewhere and stamped my luggage. On any other day they would have sent me back! As I walked to the waiting area, the members of the first car saw me. We all could finally breathe easy. They took some other detour to reach the airport. Our flight was delayed by many hours as the Prime Minister was in the city. Helicopters doing relief work had priority. Inside the plane every one had a story to tell, about how they reached the airport. The staff of Indigo gave us tea even before the flight took off. Finally I Got out of Srinagar! I could see the pilots chatting in an animated fashion, earlier they have always been a voice from the cockpit, highly efficient but hardly human. We talked to the cabin crew who started their day at 4.00 am from Dubai! Life was slowly coming back to normal. I reached home late but I reached home safely. Unfortunately the same can not be said for the people in J&K. Help them in which ever way you can. This has been my first close encounter with flooding and it has left me shaken!